De s c r i p t ion: The NTE743 requires only a single, non critical resistive tuning adjustment. This device derives left and right audio channels from the standard composite stereo decoder can also be used in a number of sub s c r i p t ion TV decoder schemes or in various proposed TV stereo systems. Using phase–lock techniques, the subcarrier (38 KHz for FM stereo) is regenerated in phase with and at exactly twice the frequency of the transmitted pilot signal. Switching between monaural and stereo operation is accomplished automatically by the presence of the pilot signal. 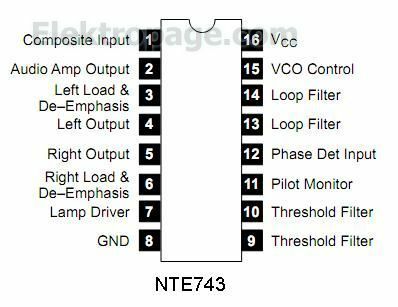 Low–impedance emitter–follower outputs and an internal voltage regulator for increased stability make the NTE743 suitable for both line–operated and automotive applications. It is designed to operate over a wide supply–voltage range and will function with supplies as low as 9V.